Iolanthe Seabourne is the greatest elemental mage of her generation - or so she's been told. The one prophesied for years to be the savior of the Realm. It is her duty and destiny to face and defeat the Bane, the most powerful tyrant and mage the world has ever known. This would be a suicide task for anyone, let alone a reluctant 16-year-old girl with no training. Joanna and the Watsons receive an unexpected visitor to 221B Baker Street during a nocturnal storm. A rain-drenched Dr. Alexander Verner has just returned from an unsettling trip to see a patient who he believes is being held against his will. Joanna quickly realizes Verner's patient is a high-ranking Englishman who the Germans have taken captive to pry vital information about England’s military strategies for the Great War. The police are frantic to find him before the Germans can use him to decode all of England’s undeciphered messages. When the Duke of Lexington meets the mysterious Baroness von Seidlitz-Hardenberg on a transatlantic liner, he is fascinated. She’s exactly what he’s been searching for - a beautiful woman who interests and entices him. He falls hard and fast - and soon proposes marriage. And then she disappears without a trace.… For in reality, the "baroness" is Venetia Easterbrook - a proper young widow who had her own vengeful reasons for instigating an affair with the duke. But the plan has backfired. Venetia has fallen in love with the man she despised - and there’s no telling what might happen when she is finally unmasked…. Sherry Thomas is the best! 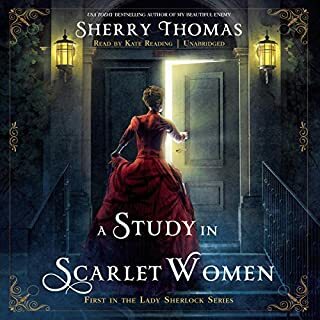 The game is afoot as Charlotte Holmes returns in USA Today best-selling author Sherry Thomas' Victorian-set Lady Sherlock series. Being shunned by society gives Charlotte Holmes the time and freedom to put her extraordinary powers of deduction to good use. As "Sherlock Holmes, consulting detective", aided by the capable Mrs. Watson, she has had great success helping with all manner of inquiries, but she is not prepared for the new client who arrives at her Upper Baker Street office. 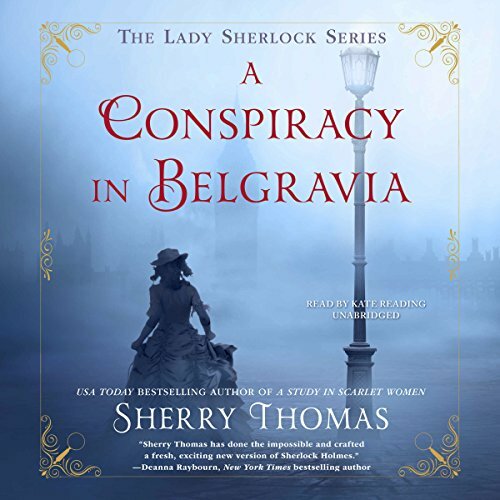 Lady Ingram, wife of Charlotte's dear friend and benefactor, wants Sherlock Holmes to find her first love, who failed to show up at their annual rendezvous. Matters of loyalty and discretion aside, the case becomes even more personal for Charlotte as the missing man is none other than Myron Finch, her illegitimate half-brother. 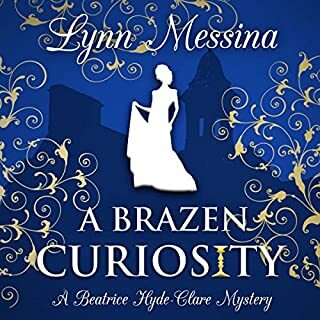 In the meanwhile, Charlotte wrestles with a surprising proposal of marriage, a mysterious stranger woos her sister Livia, and an unidentified body surfaces where least expected. 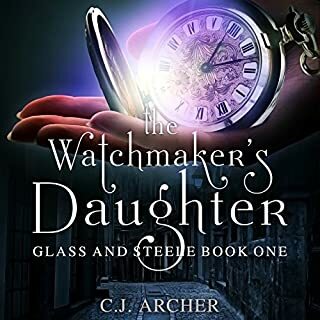 Charlotte's investigative prowess is challenged as never before: Can she find her brother in time - or will he, too, end up as a nameless corpse somewhere in the belly of London? ©2017 Sherry Thomas (P)2017 Blackstone Audio, Inc. I had trouble putting it down! I originally became interested in this series because anything narrated by Kate Reading is worth the listen. Then I had to get this book because of the writing. Sherry Thomas is excellent at weaving an entirely original story from a classic piece of fiction. I love variations, especially of Pride and Prejudice. What if stories are sometimes disappointing; that was not the case with tis book. I'd give it 6 stars, if only I could. Although this mystery is a stand alone novel, I would strongly recommend listening to the first book. It not only introduces all the major players and their relationship to one another, but gives you a better understanding of their motivations. 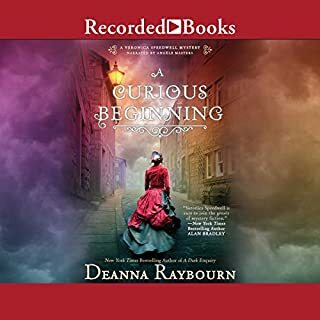 If you like the idea of a brilliant young (Victorian) woman who doesn't let society dictate her path in life, this series is for you! 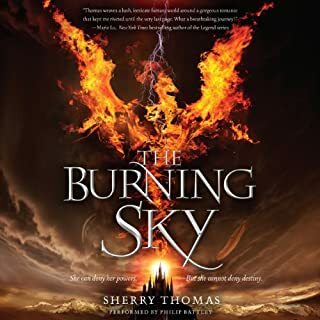 Sherry Thomas has written some really good HRs, and I own many of them, but with this series, she elevates her writing to a whole new level of WOW! 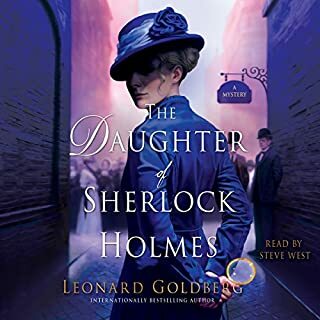 In the character of Charlotte Holmes, she gives insight into the Victorian era through the eyes of a young woman who bucks all convention, not because she is a rebel, but because there is simply no place for an intellect like hers in a patriarchal society. Despite Charlotte's determination to live life on her own terms, whatever the cost, she still has to negotiate her way around the laws of a country that counts a woman as mere chattel. I knew I was hooked when I found those limitations infuriating, but realized that Charlotte did not. She simply ignores them when she can, and works around any constrictions -- almost as if they don't exist -- when she can't. I thought we invented female empowerment in the modern era, but Thomas has invented a character that uses her power as if she knows it's all going to change someday anyway, so why not be the change she want's to see in the world, today? Amazing! The supporting cast is suitably brilliant, and the villains are as creepily evil as one would wish, providing Charlotte with lots of puzzles to solve. The mysteries are layered and just complex enough to allow the romance to sizzle in the background. This series is an auto-buy for me, and I don't have many of those. Kate Reading is, of course, perfect and brilliant, and worthy of this series. She deserves an Emmy for her acting skills! Loved every minute of this book. main character and her coterie of investigators are multidimensional and not cliche. This book (second in the series) is far more complicated than the first. Sherry Thomas proves a woman can do it better. (No offense, Arthur.) I adore everything about this series. Can hardly wait for Book 3. I hope this series continues indefinitely. I was for some reason not expecting to like this second installment as much as I did the first, but I shouldn't have worried.....I didn't like the plot as much as previously, but I liked the greater character development. I think my favourite quote is when Charolotte was sitting in front of her vanity mirror "pinning up her hair and counting her chins"
What did you love best about A Conspiracy in Belgravia? Great characters and story telling. It kept me guessing up to the end. Everything - she is the perfect narrator. I did and have the dark eye-circles to show for it. I thought the first installment in this series was an all out hit. This one struggled out of the gate and stayed confusing up until the final third of the book. Even as the author brought the story together at the end it was hard to be happy given the journey it took to get there. I will read the third installment in the hopes it captures the thrill of the first. This one....well, not as well thought out....It needed a little more story and a little less digression for my taste. This is the 2nd in this series and was as good as the first. Of course,Kate Reading's narration is also a major plus. I'm hoping Sherry Thomas will add more to this particular series.